Conrad Rocks! : Why did God let my dad die? Why did God let my dad die? A question was posed recently, "Why doesn't God heal my dad?". 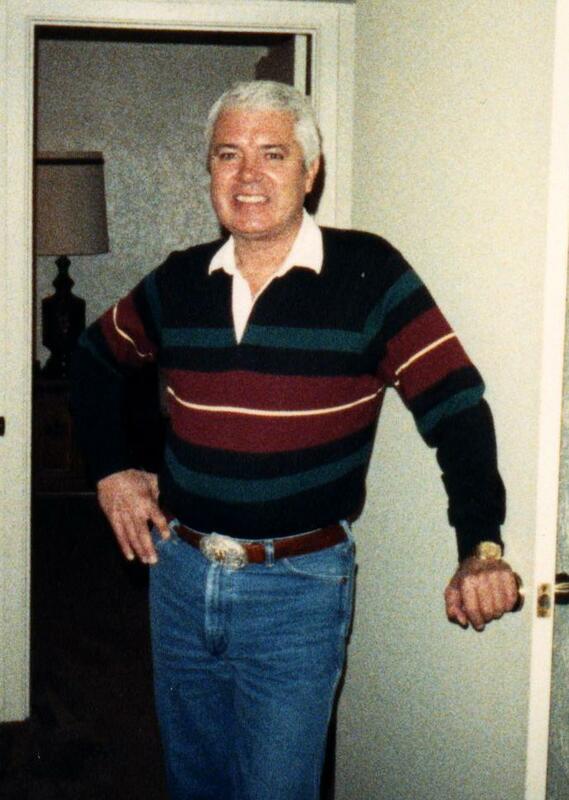 I am sure a lot of you know that I lost my dad to a brain tumor back in 1999. That event changed my life dramatically. It threw me into a tail spin. I had panic attacks, lost my wife, and somehow in the midst of it all got much closer to God. I know God heals. I have seen Him do it time after time. I have seen David George recover his mind live at bread of life church. I have met Gary Wood who sings praises to the Lord with severed vocal chords. I have seen cancers healed , eyes straightened, and barren wombs give fruit. I have no question that God heals. Why didn't God heal my dad? When Weldon, my dad, was diagnosed with a brain tumor on June 1st, 1999 I decided I was going to pull out all the stops for my Dad's healing. I rejected the report that dad would die in four and one half months - which he did pass on that exact day. This was foretold by an unsaved doctor. My brother and I laid hands on dad and prayed right there in the hospital multiple times. We prayed earnestly and fervently according to what we thought that meant. James 5:16 ........ The effectual fervent prayer of a righteous man availeth much. When dad was sent home I got down on my knees and prayed with dad. I fasted and prayed. I sought God earnestly. Dad only got worse day after day for four and a half months. Dad was losing his ability to talk on his birthday two days before he passed. I bought him a cross that he could look at from his hospice bed. As I put it up for him, I told him "Dad, you have to have faith"
He looked at me with eyes that assured me and he said, "I can have faith in God". I cried and knew that dad was in Jesus' hands. In spite of all of dad's pain and suffering, he was more worried about me than himself. When he could talk, he kept asking me if I was all right. Somehow later I knew that I had just one more opportunity to speak to him before he slipped into a coma. I told dad as I tearfully squeezed his hand, "I love you dad". He looked at me and said "I love you too". Those were the last words I heard him utter. Dad finally passed on the very day the doctor said he would. I questioned my faith. But for some reason I never took God off the throne. Something deep within my spirit churned within me and assured me that everything was going to be OK. My outer soul man, however, went into all kind of emotional convulsions. I had panic attacks and was an emotional wreck. My wife soon left me. I was a mess in the outward man. The inward spirit, however, realized there was a purpose. The inward man was anchored in Christ. I sought God earnestly for years asking Him why he let my dad die. Over the course of a few years He revealed, or rather reminded me of something. I have kept this to myself for years, but now I am ready to share it with you. Yes, we all know this verse. All things work for the good of those that are called and love God. I knew I had a call. I knew I loved God. Then my attention was drawn to the fact that is was His purpose that i was made for. Not my own purpose. HIS purpose. God had brought me to the fact that He foreknew us before we were even in the womb. Well, God knew me before I was born. This is interesting because I used to pray to God as a child. I had a relationship with Him and it was like I already knew Him. I had child like faith (Luke 18:17). God has answered many of my prayers that I prayed as a young child. I prayed for a white horse and got it within two weeks. He has answered other prayers from those early years over the course of my lifetime. As a child, my mind wasn't so confused with all this theology that it has now. I was simply praying as a child and it is as if i have always known Him. I had child like faith because I was a child! Somehow the things that we go through are linked to our destiny. No matter how bad these fiery trials (1 Peter 4:12) are - once we are through them we are the better for it. The potter (Romans 9:20-23) conforms us to the image of His Son. Peter even tells us to rejoice in our trials (See also James 1:2)! We love a God that we may have not seen. We love a God that foreknew us before we were born. This God has given us a call and a destiny. A purpose for our lives. A destiny to be conformed into the image of His Son. Now, no matter what comes my way, I know that God is on the throne and I am being conformed to the image of His Son. This gives me comfort and a peace that surpasses understanding (Philippians 4:7). This life on earth is short. It is a blip on the radar of eternity. I may not understand everything, but I am learning to understand that all things work for good to them that love God, to them who are the called according to his purpose. I want to encourage you. No matter what trial you are going through. Keep the faith. It will work out for good. You may not see it right now, but you will in the long run. I'm sorry to hear about your dad passing away back then, that must have been hard. Even so, I didn't know you had a wife then too and that she left. That had to be very difficult. I am glad though, despite all this, you did not take God off his throne and abandon your faith. Jesus indeed, does rule. thanks Noah.. yeah, it was rough. But i got through it... and hopefully this post will help others. Thank you for sharing this wonderful testimony! I was blessed!